The community of Brentwood is a special instance in the Nashville real estate market, in that it straddles the Davidson-Williamson County line due to post office regulations. 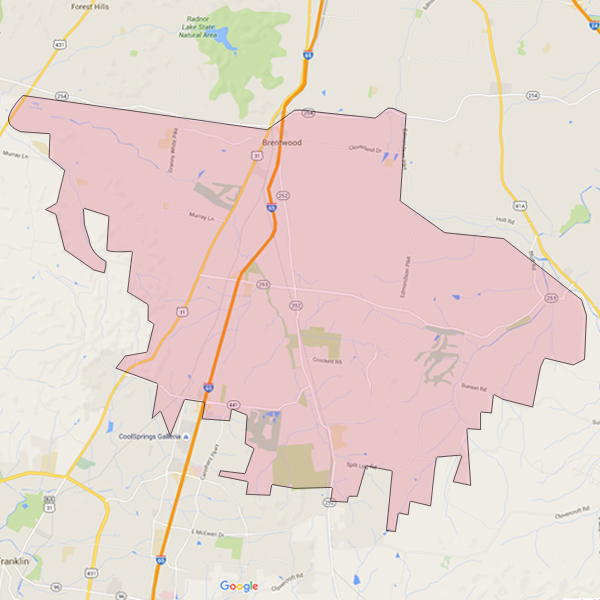 The smaller, Davidson County side is bordered by Old Hickory Boulevard, Nolensville Road, Franklin Road, and the county line, and it is serviced by Metro Nashville schools and government. On the other side of the county line, the independent city of Brentwood occupies the northeast corner of Williamson County, and it is one of the wealthiest communities in the country relative to the cost of living. Regardless of which side of the county line you choose, Brentwood is an excellent place to raise a family and enjoy all the riches of the Nashville area! Conveniently nestled between the business centers of Nashville and Franklin, Brentwood provides easy access to the best of both cities—from job, cultural, and leisure opportunities to shopping and dining options. Brentwood is just minutes away from Cool Springs and Cool Springs Galleria, where you’ll find some of the best shopping, dining, and entertainment in Tennessee. It is also close to the stunningly beautiful Radnor Lake Natural Area, a 1,332-acre park and protected wildlife area. Inside Brentwood you’ll find even more parks and outdoor recreation at golf clubs, country clubs, public parks, and recreation centers. In addition, Brentwood is home to some of the most highly regarded public and private schools in the Nashville area, including Franklin Road Academy and Brentwood High School. Real estate in this highly-sought after and fashionable community is varied in terms of size, form, and style. Brentwood includes housing that can accommodate large families and small—in stand-alone historic homes, mid-century ranch homes, new construction townhomes, condominiums, luxury homes, and everything in between—all in a variety of architectural styles and housing developments to suit every taste. Whatever it is your heart desires, you’re sure to find it here!